To enquire about arranging a baptism (christening), come and visit us during our ‘Office hours’ – 6.30 p.m. to 7.30 p.m. on any Friday evening. 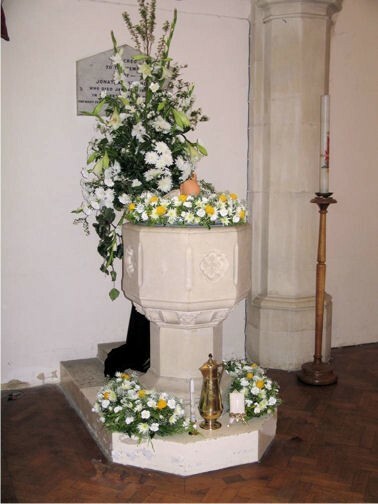 Baptisms are generally held at 12 or 12.45pm on a Sunday, although they can also be arranged during the 10 a.m. service on a Sunday morning. When you visit us we will be able to help you discover whether Christ Church is your parish church and, if necessary, we can help you get in touch with your own parish. If you can’t manage that time, then call the church office on 01474 352643, or use the email link from this site. When you visit us you will be invited to a Baptism Preparation session on a Saturday morning between 11am and 12.30pm. This is an opportunity to learn a little more of what baptism (Christening) is all about in a light-hearted way... and after the session you can book a date for the baptism of your baby. Adults considering making a commitment to the Christian faith are generally encouraged to be confirmed at the same time as they are baptised. If you are thinking about it, why not contact us and come and talk about it?